Melting metal at home to use for an art project is not a difficult task when you use the right equipment and tools. One option that you might find interesting is a DIY foundry. This is a tool that can be used when you want to melt soda cans. Soda cans are made of tin and do not need high temperatures to melt. The use of a DIY foundry at your home can be used to recycle metal to use to make different pieces of art. This includes ingots that can be used for casting art to display or to sell. 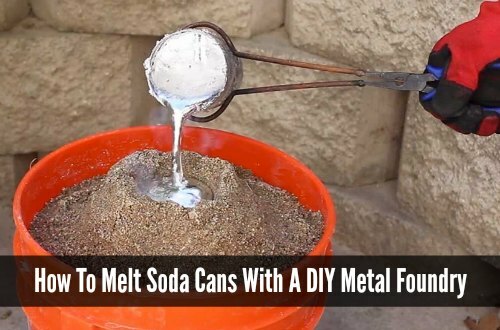 A DIY foundry is a good option to easily melt soda cans. A simple DIY foundry is made to be reusable and requires the use of a 5-gallon bucket. This may not be a good option for people who are not familiar with melting metal. If you are not used to this process, then further research may be needed. You can easily melt soda cans, but there is also an aspect of danger that needs to be considered. The aluminum that can be reclaimed when you melt soda cans can have many uses. You can make use of the metal you reclaim to cast miniature objects using a simple mold. However, you need to obtain a variety of molds is you want to melt soda cans for this purpose. Molds can be easily found online or you may make your own using clay or some other material. There are many safety issues to consider when you want to use a foundry to melt soda cans. There will be specific safety gear that is needed. This includes gloves and a face mask. You should also wear long sleeved shirts to protect your arms from burns caused by melted metal.